To most, being a control freak means one who has to have seeming power in every situation, over every little detail. They’re rarely content, and they’re often an annoyance to all. However, I want to talk about a different kind of control freak: the kind of person who has freakishly awesome control over his or her life, where what seems unlikely or unrealistic or impossible to most is viewed as totally feasible. 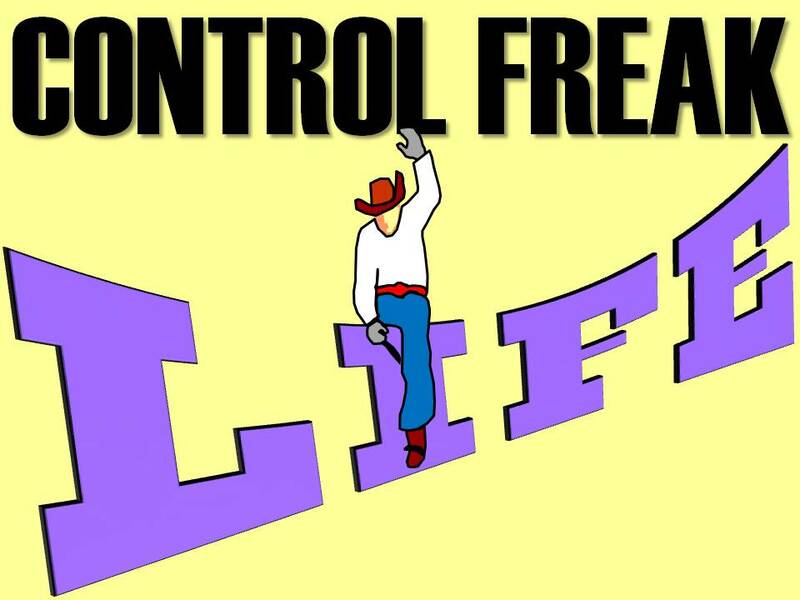 See, my definition of a control freak is someone who knows that he or she has ultimate control over his or her own life, able to accomplish virtually any goal. Think about how rare it is to be a control freak by my definition. Not only don’t people feel like they have control over their lives, they actually avoid and give up control. How many of us feel anxiety or depression because of others’ actions in our lives? How many of us stress out because a mortgage company owns our home and a finance company owns our car? How many of us work an uninspired job because we don’t think we can find better? How many of us see outside stresses as adversely effecting our relationships? How many of us have passed on life-changing opportunities and dreams because too many factors seemed in-between us and them? Indeed, perceiving a lack of control over many aspects of our lives is epidemic, and while we can’t control everything in the immediate, we have far more control to living the lives of our dreams over the long term than many fathom. College is a big topic in my house these days as my high-school-age daughter gets closer and closer. I’m amazed at how many parents think college admission is under everyone’s control but their and their children’s. Admission boards decide who gets in, schools decide who gets scholarships, the government decides who gets grants and loans, and so on. However, I’ve taken a dramatically different approach with my daughter – we’re in control of what college she goes to. Her job has been to maintain the grades and extracurricular activities to get into the college of her choice. It’s been my job to handle the finances needed to pay for her education. The result is that we’re in control of where she attends college. With that reality, how amazing is it not to wonder if your child will get into a given college, but to set them up to control the process of picking any college he or she wishes. That’s freakishly awesome control! I’m also forever amazed at what little control people assume toward opportunities based geographically where they live. I’d love to take that job, but I’d have to move…. I think she could be my soul mate, but she lives all the way across the country…. Since when does geography have control our lives? It’s the 21st century. The Wright brothers figured this one out a long time ago: the continent isn’t moving, but we can! If I have to move across the country – which I’ve done – to pursue a life-changing opportunity, all I need is a phone directory to look up moving companies. Now, I know what you’re thinking: Mark, life just isn’t that simple for most of us. And, you’d be both right and wrong. Sure, while having freakishly awesome control over your life is simple, it’s not always easy. However, it is, in fact, consistency in practicing it over the long term that fosters possessing freakishly awesome control in vital areas of your life, where virtually anything is possible. I’ve never just snapped my fingers and magically had control. Rather, I work at it every day, in small and big ways alike. Due to my cerebral palsy, there are aspects of my body that I can’t control. Yet, I have complete control over how I deal with it. I don’t mind having to physically attempt a task as many times as it takes to accomplish it because my cerebral palsy doesn’t control my life – I do. I choose patience and perseverance over allowing cerebral palsy to dictate my potentials. In this way, personal accountability is a vital component of freakishly awesome control. You’re not a victim of circumstance, but you’re the final vote toward how your life evolves. I had no control over receiving cerebral palsy, but I’ve had complete control of how I choose to live with it. Circumstances occur, and as long as your willing to react to them with positive action, you’ll have ultimate control over their effect in the end. More than any other aspect, though, having freakishly awesome control over your life removes excuses. If you assume freakishly awesome control over your life, you are solely responsible for your life’s successes and failures. You can’t blame disability or other people’s actions or the economy or on and on for any aspect wrong in your life over the long term. Rather, when there’s an occurrence in your life, you’re responsible for it, period. Again, you may not have caused it,, but you can control its effect. There’s no room for blame or bitterness or excuses, just personal accountability. You’re ultimately in control of your life, and if you don’t assume ultimate control, you’ll fail miserably over and over. And, it becomes amazingly liberating when you realize that the only roadblocks in your life are ones that you chose to stop at, that you have the power to turn the wheel and stomp the throttle of life, going where you wish. Indeed, too many give up too much control to too many circumstances and others. Why not take freakishly awesome control of your life and assert that no disability, person, geography or any other factor can dictate your paths but you? Take accountability, remove excuses, assume freakishly awesome control of your life, and you’ll live the life of your dreams. After all, per the tenet of freakishly awesome control, the course of your life is solely up to you.